I have combination skin; some parts dry, some oily and some normal. This works well for my skin. It absorbs quickly and feels very refreshing. You instantly feel hydrated and smooth. Works wonders on my skin because I tend to have some dry flaky patches occasionally. This helps keep that smooth, especially under makeup. It feels lightweight and it won't weigh you down or clog your pores. To begin, I love the packaging and the color of the gel-cream. It also feels refreshing as it glides on smoothly onto skin. If I were to compare it, I'd say it feels like Clinique's Moisture Surge but for a fraction of the price. I love the cooling refreshed sensation of this when I apply it on my skin. It dries quickly and works really well during the summer time to prevent you from looking shiny if you happen to have oily skin like me. HOWEVER the down side is that I don't feel protected from the sun since it doesn't have any SPF in it. I wish they would make SPF in it. 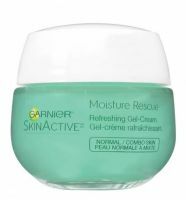 This product is not really good for me during the w...read moreinter since it doesn't stop my skin from flaking. I apply foundation on top of this to cover my imperfections and this product just flakes off like dried up glue. So all in all i would say it's not really good for summer due to no SPF and not really good for winter too due to it flaking. It's more of an autumn product when the sun doesn't shine too hard.